Just because you see the world clearly now doesn’t mean it won’t start to blur as you age. Age-related macular degeneration is the leading cause of legal blindness for people over 60 years old in the United States. 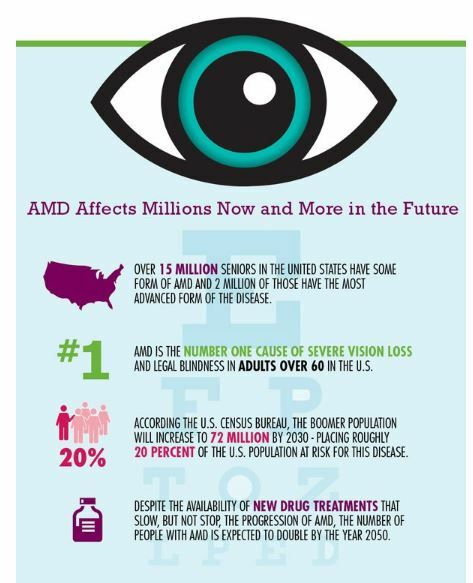 More than 15 million Americans are affected by some form of macular degeneration, a progressive disease which can lead to severe vision loss in the most advanced form, end-stage age related macular degeneration. If you’ve never heard of macular degeneration, you’re not alone. According to a recent survey from CentraSight, 74 percent of Americans do not know that macular degeneration is the leading cause of legal blindness in the developed world. It does not cause complete blindness but destroys central vision, the straight-ahead, detailed vision needed for everyday activities such as self-care, recognizing faces, preparing food, driving, and reading, to name a few. In an effort to improve awareness of this disease, here is some important information you need to know about macular degeneration. Wet age-related macular degeneration: Caused by abnormal blood vessels that leak fluid or blood into the region of the macula. Dry age-related macular degeneration: More common and marked by deterioration and/or scarring of the macula. What type of help do people with macular degeneration require? As macular degeneration worsens and vision diminishes, the need for caregiving increases. Notably, a recent survey found that more than one in three Americans (35 percent) who know someone with macular degeneration assist them frequently. This supports studies finding that people living with advanced macular degeneration may need assistance nearly four hours a day, five days a week. 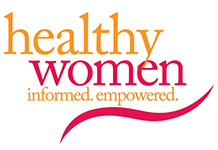 Spouses or adult children provide 72 percent of that care. Care includes help with preparing meals, driving, reading and writing. Macular degeneration can be devastating for patients and their families. A 2016 study in Clinical Ophthalmology found that people with macular degeneration are at higher risk for depression and anxiety. For tips on how to care for a loved one with macular degeneration click here. Unfortunately, there is currently no cure for this disease. To manage macular degeneration, depending on the severity, an ophthalmologist (eye doctor) may recommend treatments that include external visionassistive devices as well as vitamins, drug (intraocular injections) or laser therapies. These treatments may slow or stabilize progression of macular degeneration. People aged 65 and older who progress to the most advanced form of the disease and are no longer candidates for any other treatments mentioned above might want to ask their ophthalmologist about whether they are a candidate for a new surgical treatment option—a tiny telescope implant. The size of a pea, this FDA-approved device is surgically implanted in an outpatient procedure and has been shown to restore vision and improve quality of life, following rehabilitation, in select patients. Interested people can take a short quiz to find out if they might be candidates for the telescope implant here. Not all treatments are appropriate for everyone. It’s important to see an eye care professional regularly to design an individualized treatment plan. How fast will my vision loss progress? What’s the best way to monitor my vision for changes? To find out if you or a loved one could be a candidate for the telescope implant procedure, please visit www.CentraSight.com.